OK, so maybe the birth of Erwin Schrödinger isn’t technically a holiday, but it should be! Those of us in the field know that Schrödinger was one of the founding fathers of quantum mechanics. He won the Nobel Prize in Physics in 1933 for developing the Schrödinger Equation which describes the quantum state of a system and how it might change over time. In layman’s terms, it’s a really complicated equation that is difficult to solve for some systems and impossible to solve for others, but it explains how atomic particles like electrons can act both like a wave and a particle at the same time. For scientists, this is pretty cool. People who maybe aren’t into science so much may still have heard of Erwin Schrödinger’s cat. Schrödinger’s Cat is a famous thought experiment where there is a cat in a box that may be either dead or alive based on a random earlier event. Only once the observer opened the box would the cat actually be determined to be dead or alive, and therefore the observer affects the outcome…I think. It’s also sort of confusing stuff. Maybe this xkcd will help you understand. 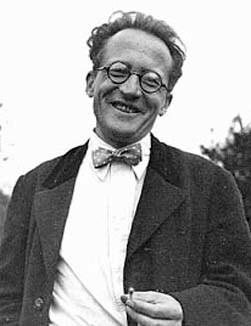 In any case, Happy Birthday Dr. Schrödinger! ← Happy Presidential Joke Day! ne We Mourn For Him And Honoring His Birthday In Deep Sadness! RIP. PS We Will Miss You, Dr. Erwin!!! Happy Birthday, Man!! !